Learn how to look for B-lines in <6 mins! It’s been a hot minute since I’ve updated my b-lines vid. Main thing here: remember that b-lines = increased density in the lung, not necessarily always from CHF. I’ve had trouble understanding the quantification of B-lines. In your talk you say “3 B-lines” per zone is considered a positive zone. Over what length of time do you look for B-lines? Does it have to be 3 B-lines all the time, or 3 B-lines seen over 10 sec? 10min? I generally use a gestalt…there are B-lines most of the time, as a positive, as opposed to counting B-lines. As well, sometime it’s hard to know what’s a few individual B-line and what’s a B-smear (a bunch of confluent B-lines). Should we get away from this B-line quantification and use more of qualified assessment (ie. A-lines no B’s, occasional Bs, constant Bs etc)? Hey Joey, thanks for your comment. I look over at least one respiratory cycle, which is often <10 seconds. The whole 3 b-lines thing is mostly based off of the international consensus document. 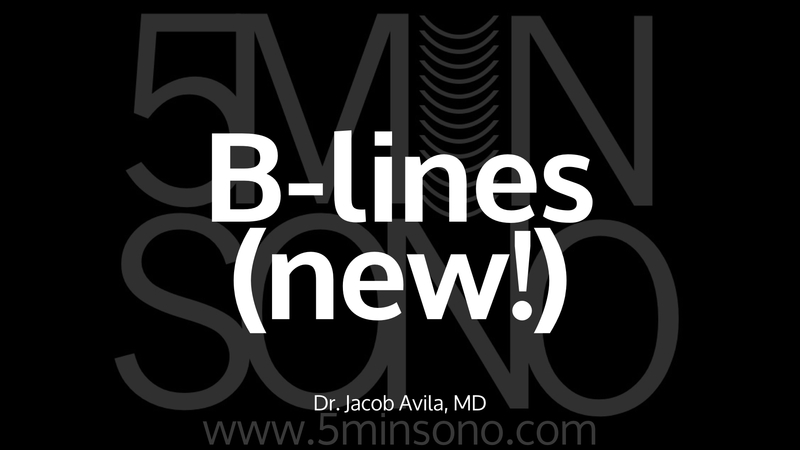 Clinically, its kind’ve a “yes” or “no” as far as b-lines. I look for not a lot of b-lines, or a lot of b-lines. Additionally its important to remember that ultrasound should never be used in isolation. Use your b-line assessment along side your physical exam, labs, other radiography and EKG.